This mission was completed on schedule as planned and the missionaries came from various parts of the US to care for patients at the Van Domelen clinic and for the children at St. Peter Claver School. In addition to working in the clinic and school program, many members of the team visited White Wing Village and were moved by the level of poverty. They also visited the Mustard Seed facility and observed great care to the residents from their providers. As is so often the case with mission work, all was not perfect….and thanks to the experienced, versatile and dedicated missionaries, the issues were surmounted and dealt with. The team worked long hours, especially on Monday and Tuesday, but they persisted. We were additionally blessed at this mission to have two students from the College of Oral Health Sciences at the University of Technology, in Kingston participating. Both are near graduation and brought with them hundreds of hours of clinical experience, and they were a tremendous help to the team. This is a relationship I have been working on for quite some time and hopefully something can be developed in the future to foster our mission movement. The two students are: Ruth-Anne Leveridge and Ajani Blake. We thank them wholeheartedly for their devotion and wish them well with their careers. Hopefully they will return in the not too distant future. In total, 23 class groups were seen at the St. Peter Claver School. Anne Weierback, RDH led the team on the first day and Mary Rebman, RDH, Brittani Collinsworth, RDH, Felicia Williams, RDH and Sherilyn Glanville, DA rotated through the three days to educate, screen, and provide a fluoride varnish treatment to 731 children. All students were given oral health education, received a treatment of fluoride varnish, were examined for dental deficiencies, and handed a “goodie-bag” with tooth brush, paste, floss and a toy. The numbers are low in comparison to prior missions due to the problems with power coming in to the X-Ray equipment and an overheating problem with some of the equipment….both of which need to be corrected. As a consequence, some patients needed to be turned away in spite of the additional hours of work provided by the dedicated missionaries. Michele commented: I’m very proud of the team and how they worked hard to provide the best treatment possible for a population who otherwise would not have had the access or means to receive dental care. They demonstrated flexibility and a spirit of cooperation under tough circumstances. I applaud them for their sacrifice and willingness to serve. 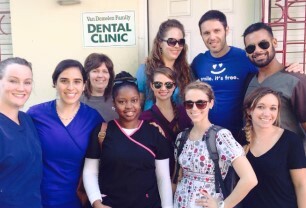 Three of our missionaries (Mary, Brittani and Anne) had the opportunity to visit the Hope Clinic in Montego Bay. They were also able to mingle with locals through the generosity of Deacon Baldwin Powell and the staff of the clinic. All the patients were VERY thankful we came and I had a few tell me stories of how they have really learned to take care of their oral health better. One lady used to have severe bleeding gums and bone loss. She was able to save her teeth through the efforts of the clinic and her being compliant with home care. Some people would wait several hours to be seen but they stayed because they knew there wasn’t another option. I’m thankful we were able to provide wonderful services. Many of the patients were also attending for the first time. I love being able to work with the local dental students. They were a great resource to connect the patients to a place that could provide care for a cheaper rate. This report is all about the fourth mission we conduct to Seaford Town and as a result of the hard-working and devoted missionaries, more than 300 patients were treated to a good dose of tender loving care. Paul Curti, Trained Optical Assistant. he team worked very long hours in the unusually hot weather to spread God’s love to those in need. Medical: 99 Patients seen over ¼ of them for Blood Pressure issues and over 10 % for Blood Sugar situations. Many children were seen for various infectious conditions and there were many patients treated for skin issues, chest pain, various respiratory problems and infections. Unfortunately, the order of supplies we had placed with our supplier in Jamaica was only partially filled and delivered at last minute. It was very frustrating not having all the proper meds to treat so many who came in seeking our help. This is an on-going problem which will need to be addressed. Dental: Our returning dentist Dr. Mary was very busy working with our portable dental equipment and she along with her assistant Paulette performed 35 extractions and 14 fillings plus many other treatments…..some patients had to be turned away due to the lack of a working X-Ray facility which we hope to have operative in time for the next mission, but mostly for lack of time in the day to take care of them. Our two RDH, sharing one chair were able to perform cleanings for 52 patients. Purchase and installation of a third and permanent dental station had been approved by the board, but that has been put on hold until several scenarios play themselves out. This would be (in addition to the two “souped up” portable units we are now using. This would allow us to have two dentists working at one time in an effort to make a more significant dent in the huge dental issues that exist at Seaford Town. One missionary posted on Facebook: We had a great team this trip and made amazing things happen….These people are very poor and they try to make a living by selling things they have made. Many live the Rastafarian lifestyle and I have learned a lot about the culture this week…….It literally broke my heart to turn patients away that wanted to get their teeth cleaned, we ran out of time and could’ve stayed there for weeks! ………..Not only did the people appreciate us being there providing vision, dental and medical care and giving so much love to them. This was just as much for me as it was for them. At present, we have a mission organized for St. Pius in Kingston for April 23-24-25 led by veteran mission leader Michele LaBasi (RDH from Akron Ohio). They will treat the students at St. Peter Claver School plus a full roster of patient appointments at the VanDomelen Clinic. Further, we had a dental team of 5 dental persons organized for June 21-22-23. 2018 for Seaford Town, however that has to be put on “hold” as Father Luke will be away at that time. Hopefully this can be rescheduled. When we reorganize that group, it would be nice to have some medical folks to join them. RE: February 5, 6, 7, 2018 mission to St. Pius mission campus, Kingston JA. First of all, sorry for the delay……..have had a mission to Seaford Town last week and planning another to Kingston in April…..all coupled with a fund raising concert next week. This mission was comprised of 9 U.S. Air Force volunteers and one from the navy. Caroline Bunce, Team leader, RDH, Charleston, SC. The VanDomelen Clinic was host to this wonderful group of military personnel on February 5, 6 & 7, 2018. The St. Pius ground crew consisting of Marie, Boxer and Rosemarie were so helpful and per Caroline, their attitudes made it so pleasant to work with them. The balance of the St. Pius team, Deacon Vivian, Miss Vivienne Bradford were again a tremendous help to the missionaries. At present, we are doing the final organization of our April 23-24 and 25 mission to Kingston and that team led by veteran mission Team Leader Michele LaBasi is complete. We have a team of dental volunteers working on a June mission to Seaford Town and would welcome medical personnel to join them. This mission consisted of a dental team and a medical team as there were no volunteers to do the optical part. As usual, Father Luke and Sister Jhorna were extremely hospitable to the missionaries and they participated in the mission activities from morning to night from the team‘s arrival at the airport until they departed Sunday morning. Boxer our friend from Kingston joined the team for his 3rd trip to Sacred Heart and was the all-around “go-for” plus he now has been trained to perform all the sterilizing for both teams. For the first time, our team traveled to Jamaica with pre-natal and children’s Vitamins in their luggage. Hopefully, this will be the start of a program to provide vitamins to a population who never had access to them. If this pilot program goes off well, this could possibly become a part of our fundraising activities in the future. In all, the teams saw a total of 243 patients—all from impoverished families and all in direr need of our help. Temperatures and humidity rose to very uncomfortable levels, but the entire team worked through it like real troopers. Unfortunately, THERE IS NO AIR CONDITIONING at the Sacred Heart Mission. Statistics for this mission are as follows: Total Patients seen: 243 and many of these patients received multiple treatments. From: Roger Plante (coming from reports handed in by the ten missionaries. Re: Mission to Sacred Heart Mission, Seaford Town, Westmorland, Jamaica. My heart is filled with gratitude to those very special fourteen persons who participated in the March mission to Sacred Heart. This was the first “three discipline outreach” we staged and everyone involved said it was a huge success. Father Lukasz Szweda, pastor at Sacred Heart and the two sisters proved to be exceptional organizers and hosts to the team. Gavin Hart, Kingston, JA Registration person….Gavin is part of the choir that comes to St. John each year—He volunteered to be the registration person for this mission. Sr. Jhorna, CNA and General assistant at Sacred Heart Pharmacy and ongoing patient care. Boxer our friend from St. Pius who is always present when we need a helping hand. I have had such glowing reports from the participants it would take some 25 pages to include all of the information given to me. Here are the basic facts about this mission. It was a huge success and interaction between the three teams working in unison proved to be incredibly good. The dental folks experienced problems with the main portable dental unit and fortunately our service representative from Kingston repeatedly came to the rescue of the team and with the addition of subsidiary compressor and water cooled high speed hand-pieces, the problem was resolved….but not without causing a severe backup hiccups in the dental patient schedule……all of which was worked out and in the end, all patients booked were seen and treated. The November dental mission to St. Pius took place on November 14-15-16. The mission leader was Regina Johnson, a dental assistant and dental office manager from Tennessee. She was a first time participant at our September mission. The team reports show that there was lots of compassion flowing with team members and with the patients. As usual, Miss Vivienne Bradford and Boxer were of tremendous help to the team, and they produced fantastic results. As usual, the staff at St. Pius, Miss Vivienne Bradford and Boxer were super hosts to the group, and having the security folks around was an added bonus both for the peace of mind and for the social interaction. There was no school involvement at this mission. I came home to great results from my final state exam and now I’m officially a Hygienist. As for the November mission it was different from the last, first thing first Regina was an amazing leader, and the Jamaican staff were excellent. In my opinion, Dr. Hans was the MVP………The hygienist on the first day were very overwhelmed however the next few days they adapted and we made it work. In overall outside the clinic everyone were very nice and had great hearts. It was very interesting to see how the different work ethics came together. there and helping those who are so very grateful and so very much in need of help of any and all kinds. My heart is once again full and many many friends have been made, with a lifetime full of joy knowing we made a difference. This team far exceeded the established goals for this mission. As usual, our mission team was enhanced by the presence of Miss Vivienne Bradford, Rosemarie Warren and (Boxer) McEwan without whose help many of our little problems would not have been handled so smoothly. The mission was conducted without incident or any breakdown of equipment and the communication and accord between the missionaries was stellar. The DuPont staff was extremely cooperative and they again expressed their appreciation for all that JOP does for their student body. On Thursday morning, Dr. Bran Van Slooten and I left with Boxer for the motor trip to Seaford Town with a truckload of equipment and supplies which we have been collecting from generous donors here in the states, along with some purchased goods to set up the upcoming mission there. The scheduled dates for our first dental/medical mission there is October 20-21-22. That mission will include a dental team of 3 persons, a medical team of 4 persons a team leader and two support persons. This is a maiden voyage and our first real mission outreach to Bishop Burchell McPherson’s diocese. We know there is deep poverty there, and we are looking forward to more such missions at that location. We are always in need of dental personnel plus ER or clinic type of medical people at our missions and additionally, we are trying to equip our clinic in Montego Bay, so we are also always in need of instruments, equipment and supplies. Anything you can donate will be acknowledged with a Letter noting your donation. We are a 501-3-c corporation. As usual, huge THANK YOU to this team of devoted and dedicated individuals who made up this team, for spreading God’s love to the less fortunate.